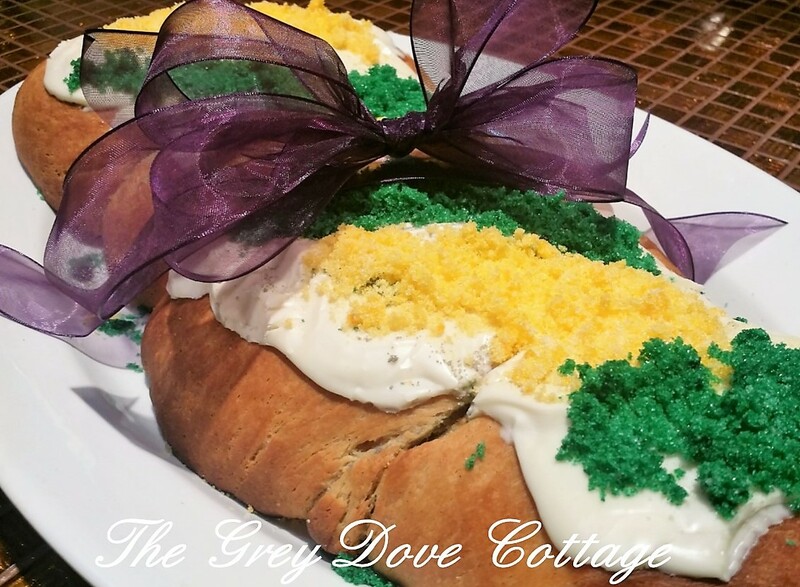 A King Cake is a tradition for the Mardi Gras season. 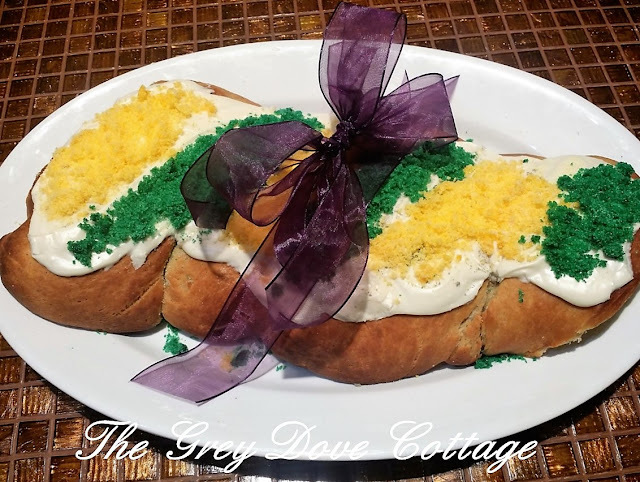 The tradition is French, the cake is an oval shaped pastry, somewhat brioche in style, glazed, and colored in Mardi Gras traditional colors of purple, gold and green. Purple signifies justice, gold signifies power, and green signifies faith. The name "King Cake", refers to Jesus, and the small plastic baby slipped into the cake after baking, represents Jesus. The King Cake represents the showing of Jesus, or epiphany, to the three wise men. 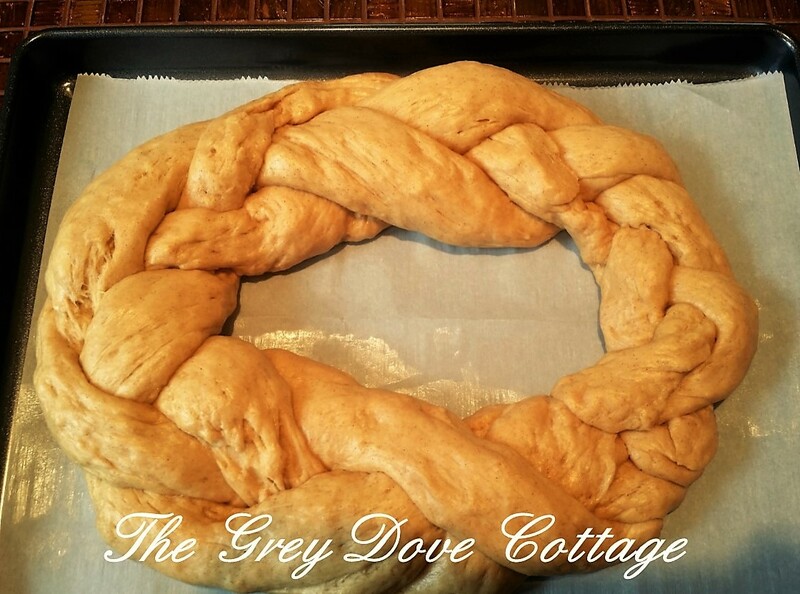 The tradition of baking a King Cake dates bake to the France, 1600's. The tradition came to New Orleans in 1870. What would a Mardi Gras be, without at least one King Cake? With Mardi Gras approaching, I thought I would try a King Cake recipe. For the recipe, I chose New Orleans Chef John Besh. 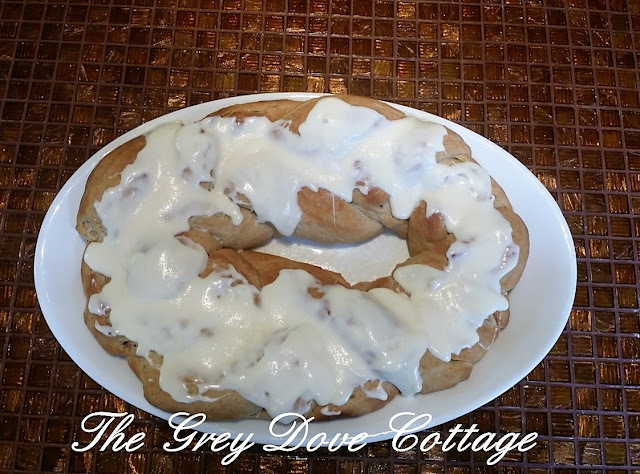 I have never made a King Cake before. The recipe is straight forward. In making the recipe I happened upon a challenge proofing the yeast in warm milk. I made a few slight variations; proofing my yeast in 1/4 cup of warm water, then using 3/4 cup of lukewarm milk, so the liquid measurement was as Chef suggested. I baked my cake at 350 degrees for a total of 20 minutes, Chef suggest baking for 30 minutes at 375 degrees. My oven tends to run a bit hot, I adjusted the baking instructions accordingly. I proofed 2 tablespoons of yeast in 1/4 cup lukewarm water in a "coffee cup", allowing it to sit for 10 minutes, until dissolved. 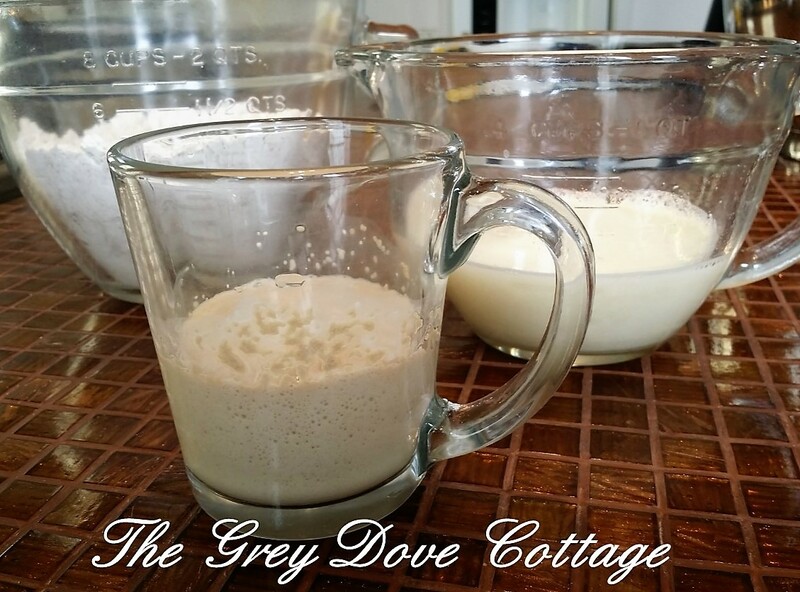 While the yeast proofed, I mixed the sugar and warm milk allowing it to sit as well, and the sugar to dissolve. 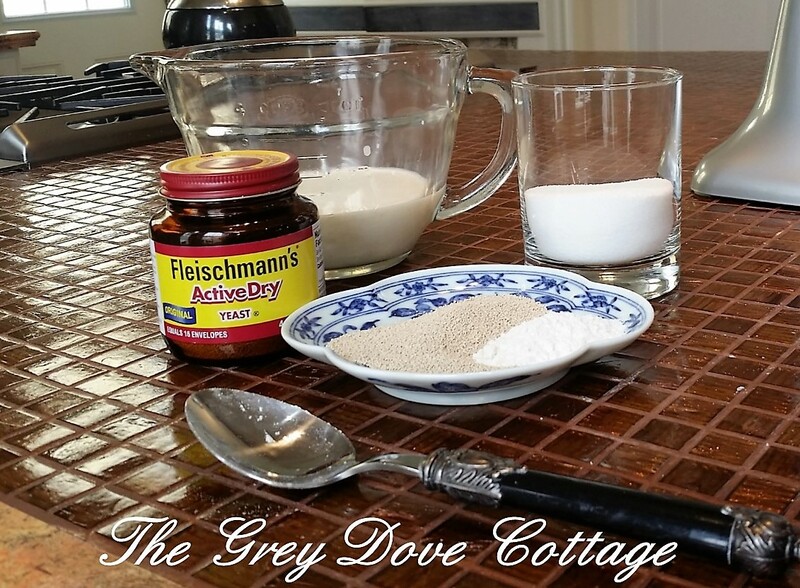 Once the yeast proofed, I combined the yeast with the milk sugar mixture. Next whisk in the butter, eggs, vanilla, and lemon zest with the milk mixture. 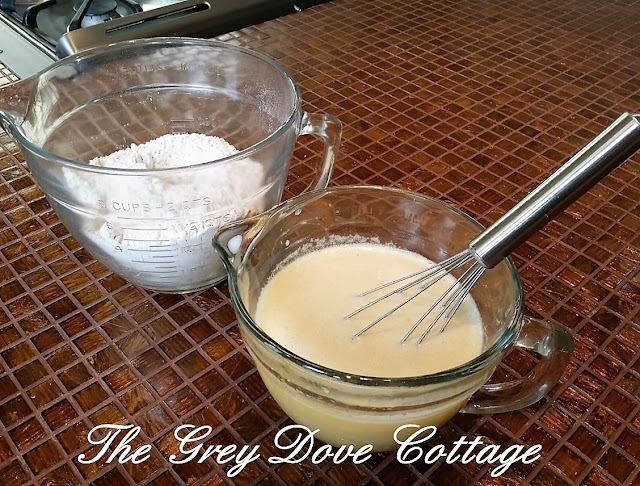 Combine the dry ingredients in a separate bowl. Add the dry ingredients; flour, cinnamon, and nutmeg, to the milk mixture. 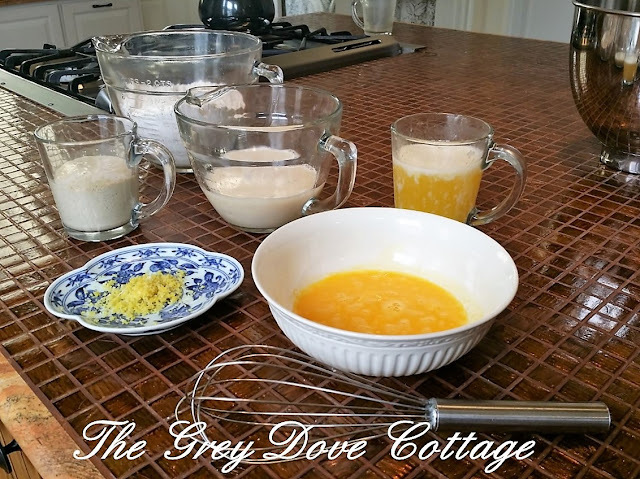 Fold the dry ingredients into the wet ingredients. 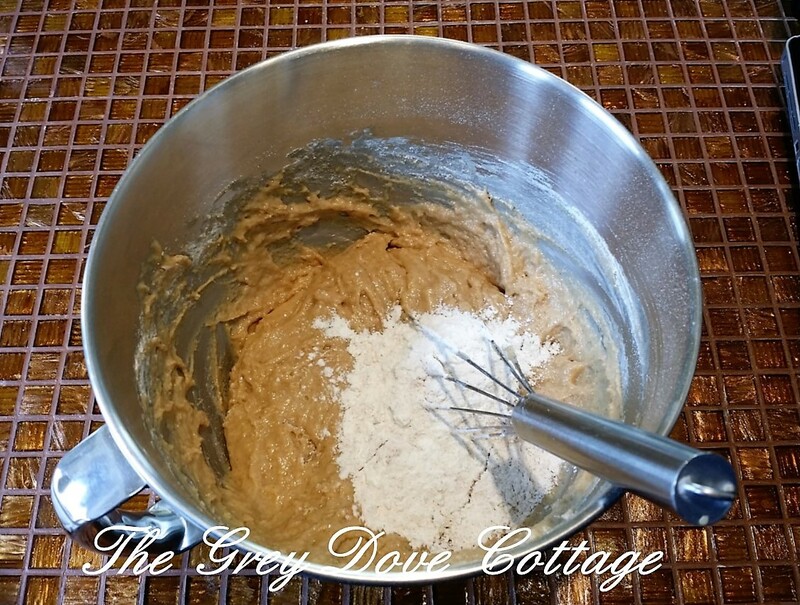 I use a stainless steel mixing bowl to rise my dough. 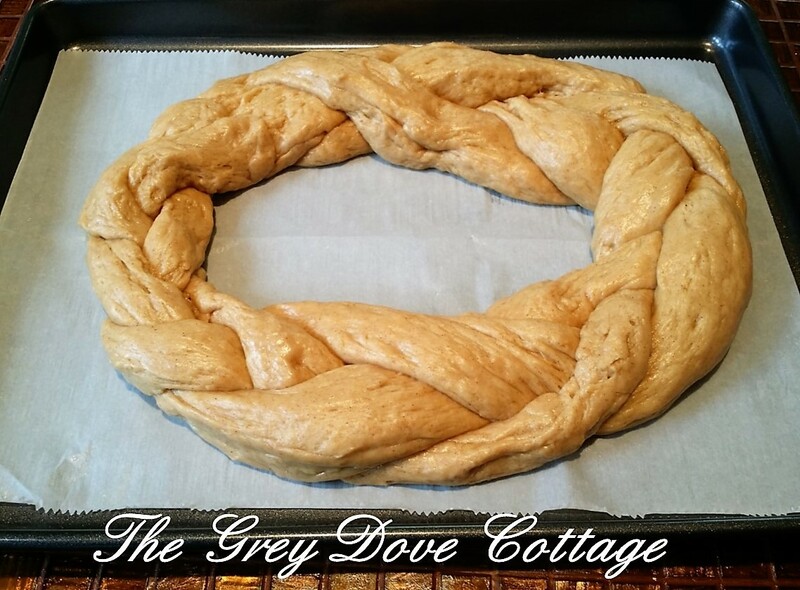 I use the same method for all breads. 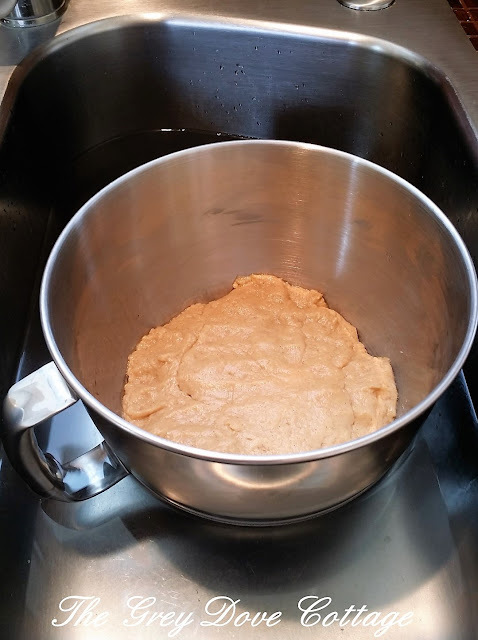 I run hot water in our stainless kitchen sink, creating a "bath" of hot water about 4" - 6" deep in the sink, then place the bowl of dough in the hot water. 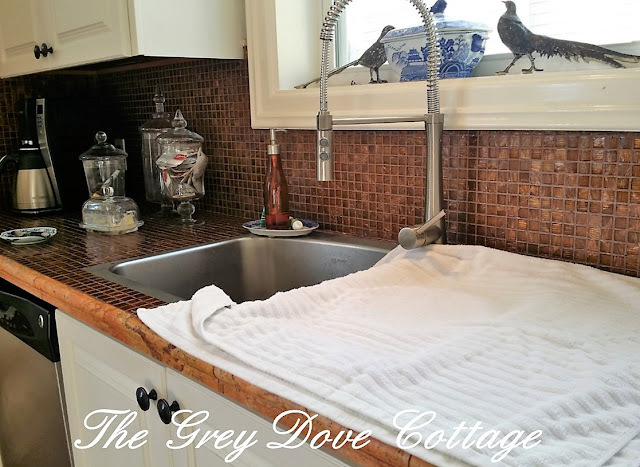 Make certain that you do not fill the sink too high making your bowl buoyant, causing the bowl to tip, and water to enter your bowl, ruining your dough. 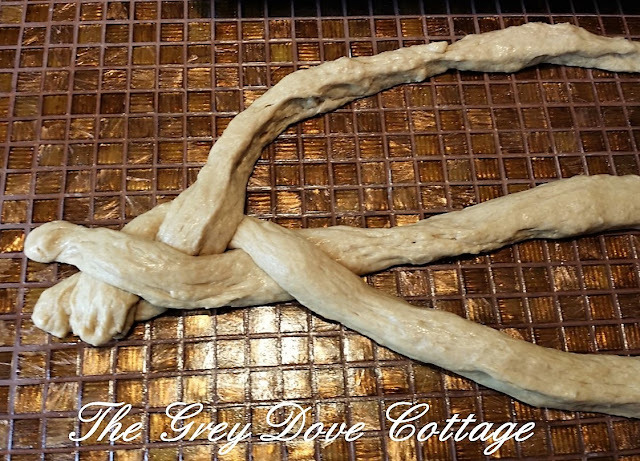 This warm bath method works well for rising dough. It is a tip I learned from an Aunt, who had a bakery. Once the bowl of dough is inserted in the bath. Then cover the sink with a clean towel. 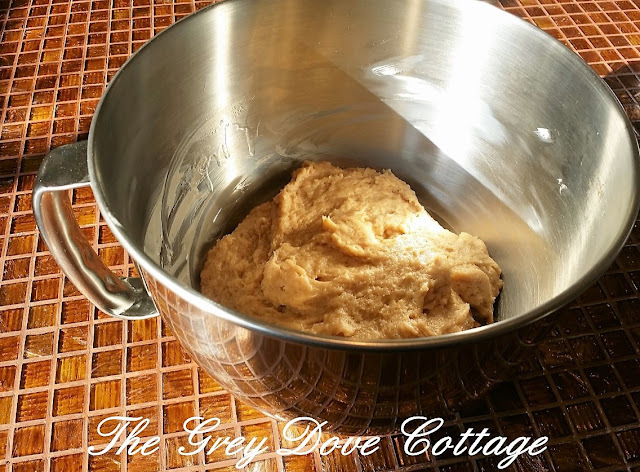 This allows the dough to rise in a moist, warm, space. I find this method prevents the "skin" from forming on the top of my bread doughs. 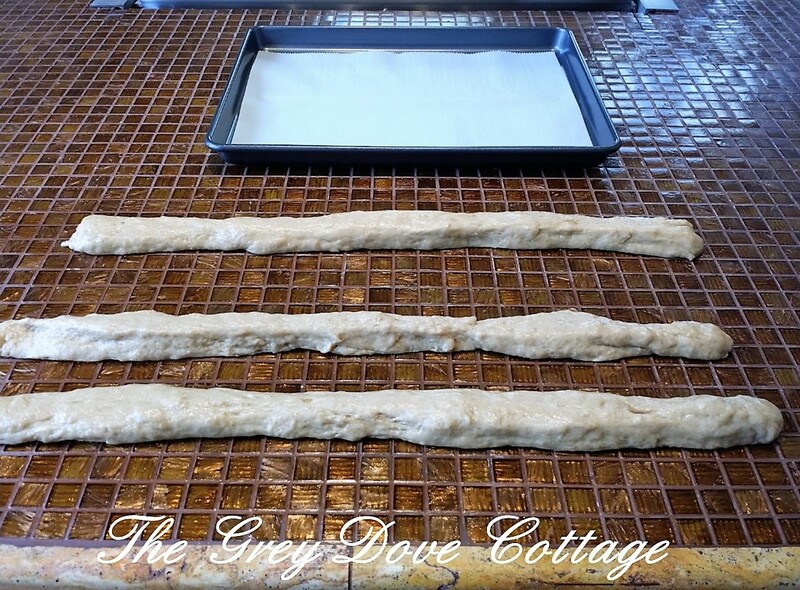 Once the dough has doubled in size, about one hour, punch the dough down, and divide it into three equal sections. Roll each section of dough between your palms into a long strip, making 3 ropes of equal length. Braid the 3 ropes around one another and then form the braided loaf into a circle, pinching ends together to seal. 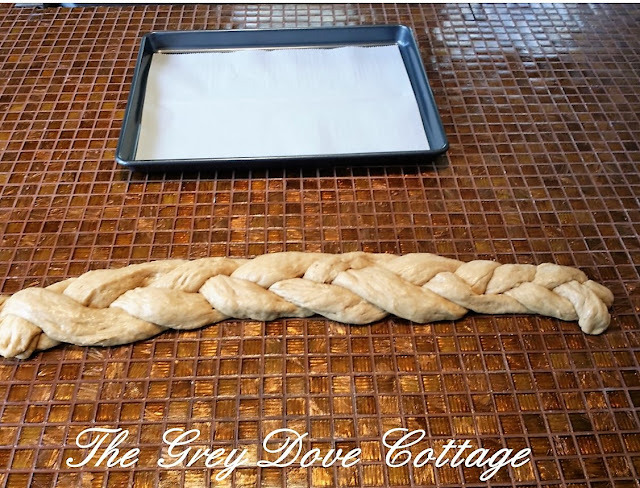 Gently lay the braided dough on a parchment lined baking pan, and let it rise until it doubles in size, about 30 minutes. Once doubled in size, place the baking sheet in the oven and bake until the braid is golden brown, 20 - 30 minutes. 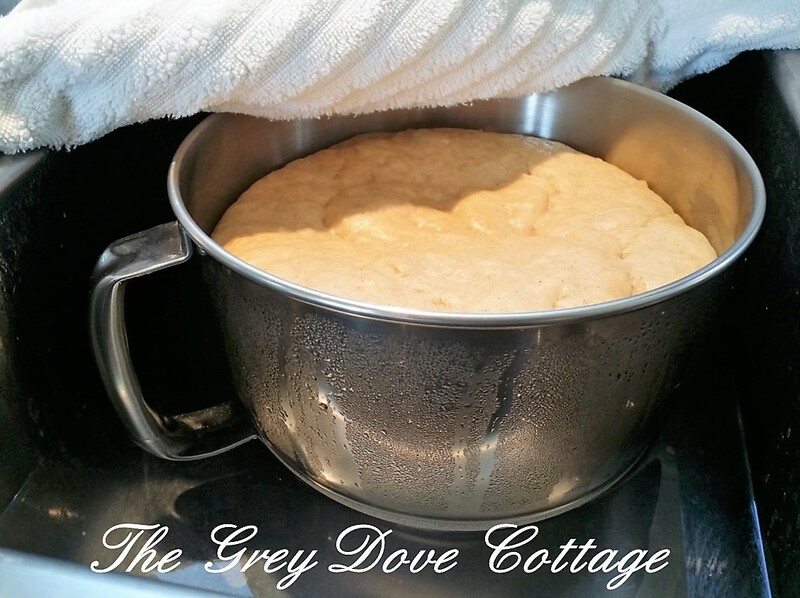 Remove the cake from the oven, place on a wire rack, and allow to cool for 30 minutes. Tuck the fève or plastic baby into the underside of the cake by cutting a small incision in the bottom, and pushing the baby into the incision. 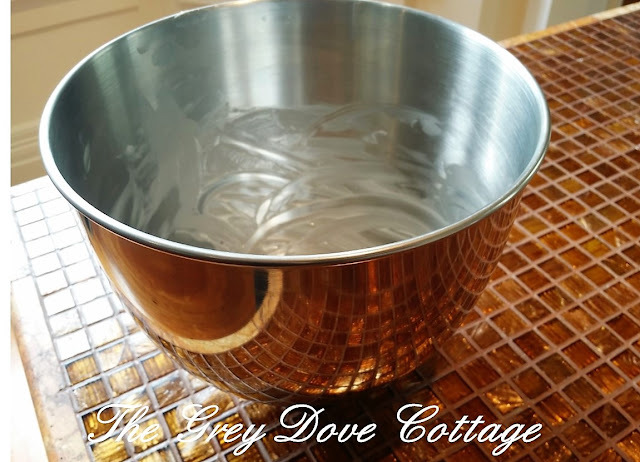 For the icing, while the cake is cooling, whisk together the powdered sugar, condensed milk, and lemon juice in a bowl until the icing is smooth and very spreadable. 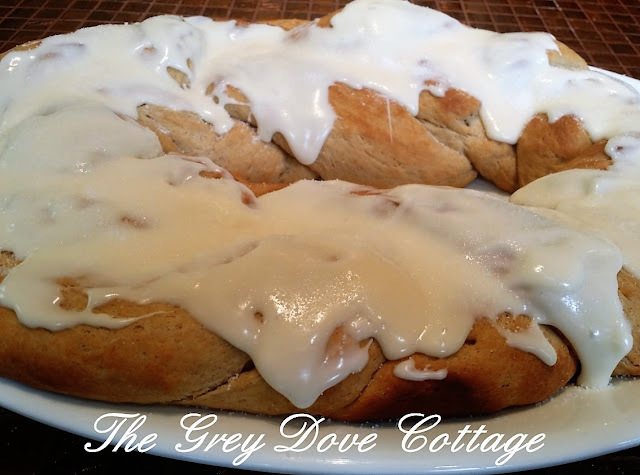 If the icing is too thick, add a bit more condensed milk, if it is too loose, add a little more confectionary sugar. Transfer the cake from the wire rack to a platter. Once the cake has cooled, spread the icing over the top of the cake and sprinkle sugar while the icing is still wet. Personally I prefer not to use the color sugar, I favor a white cake with plain sugar, a touch of gold leaf is a beautiful addition. If you prefer the traditional King Cake, to follow is my method for coloring the sugar. 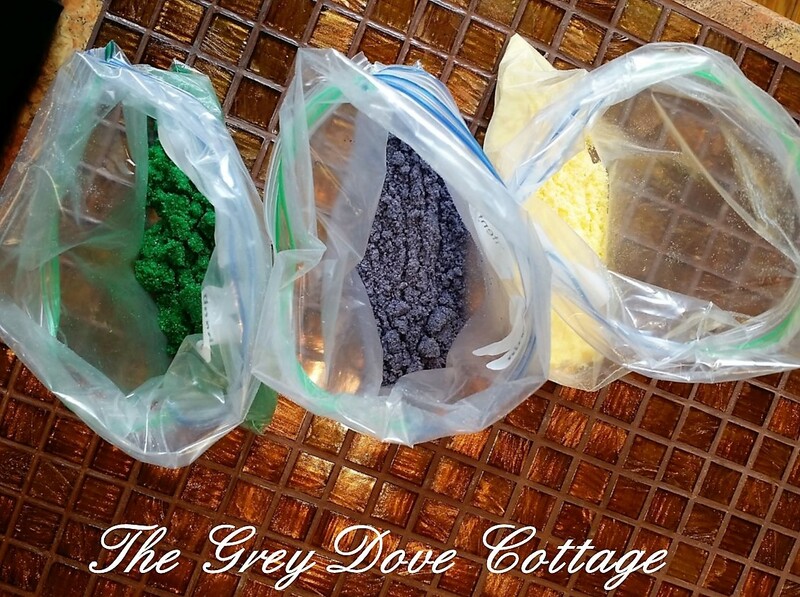 I make my own colored sugar by placing 1/4 cup of sugar in a plastic sealable bag, I made three separate bags, one for each color; purple, gold, and green. Add drops of food coloring in each bag; 4 drops red and 2 drops blue in the purple bag, 3 drops of yellow in the yellow bag, and 8 drops green in the green bag. I wanted a dark rich green to offset the purple. 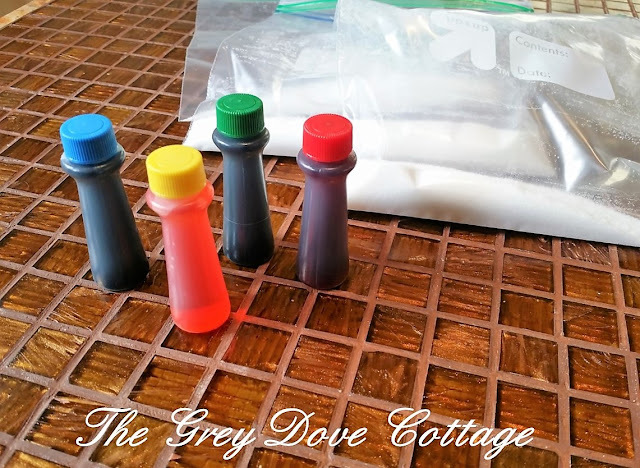 After adding the food coloring to each bag (you should have three bags; one yellow, one green, and one purple), press the coloring into the sugar using your fingertips. I pick the bag up and hold it between my thumb and index finger gently pressing. 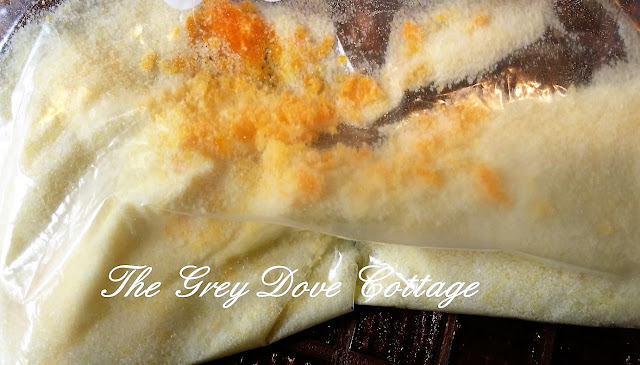 By pressing the coloring around the bag, the sugar will become infused with color. If you want a darker colored sugar add another drop. Be careful not to add too much color because the sugar will breakdown and become a glaze rather than remaining granular. I made a second King Cake, to show the traditional colored sugar decoration. For this cake I split the dough into two portions, and twisted the portions together, leaving them in a line, rather than a circle. After mixing the sugars, I felt the purple was a bit dull. I chose to use only the green and gold sugars, then add a purple ribbon to the center of the cake. However you decide to decorate your cake, it will be your own unique style, and creation.